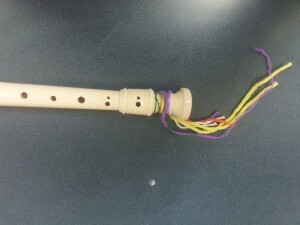 A very common program that is run by many junior music teachers is called Recorder Karate. The program is a series of songs that the kids learn on the recorder that get progressively more difficult. After each song that they have completed correctly, they receive a “karate belt” with a corresponding colour. Recorder Karate is a program that encourages student growth and allows for a highly differentiated music class. Every student is working at their own level and receiving consistent, specific feedback about their progress. You can buy the program online through Music K-8. After running this program for a few years, I have learned from some of the mistakes that I have made. I hope some of these ideas will help you with your recorder karate program. Never start the program without taking a period to do an activity on building community. When I first starting doing the program, I used to dive right in as I felt that I had such limited time with the students. However, during the program, inevitably someone received a belt before someone else and another student struggled to get through the first song. I learned that if we took the time to do activities that talked about “put-ups” instead of put-downs, this encouraged positive language and the class was less competitive. Now most students will high five each other every time someone passes, no matter what level they are at. There is only one of me in the room. I have learned to accept the fact that I see my students for 40 minutes and I cannot help everyone every period. I have learned to stress to the class that we are a big recorder learning team and we need to work together. Sometimes I assign people to help others, and other times I do a mini lesson with one group while another group is being led by another student. What I have seen is that for students, sometimes helping another student to improve solidifies their own learning. Recorder karate is great to run with one grade while you are prepping your other classes for performances or concerts. Once Recorder Karate is up and running, there is very little preparation for each period. This can be SO helpful when preparing concerts, choirs and all the other performances your students will do throughout the year. Overall, my students have had a lot of success with recorder karate and it is a program that I would recommend to junior music teachers. This was useful – especially the assessment tool. Thank you for sharing! Thank you very much for your post! I have a question: How do you deal with the noise level problem of everyone practicing something different at the same time in the class. Any advice would be greatly appreciated. Thanks! Thanks for the feedback. I will start off by being honest. Recorder Karate is a noisy experience. I try to pick a corner of my class for testing but the rest of the room is busting at the seams with noise. As I only have the students twice a week, I really want them to use the time to practice. If we are finding we need a break from the volume, we usually invite solos, duets or trios to “entertain us” with whatever part of their current song they have learned. Additionally, I may have half the kids listening and giving feedback so that only half of the class is playing at a time. Hope this helps. Thank you for sharing! This is useful information which I will definitely put into practice. This is great! I am just getting my Recorder Karate program going after lots of leg work on reading music through orff and other activities. When you run your program, do you share recorders between classes or do you have each student purchase their own recorder and keep it for themselves? I am not sure that sharing is the best idea, but the school is low income and I do not want any barriers for students. I brought this to my administration and we purchased a class set of recorders for every grade 3, 4 and 5 class in the school. One recorder was assigned to the students for grade 3, 4 and 5 and they were cleaned at the end of grade 5. These recorders stayed at school and were for practice in class as they belonged to the school. It was always optional to buy recorders for home practice. I also encouraged my students to borrow one from cousins or older siblings so that parents only had to buy one.